If we start the actual knitting before Tollway Tatters, I'll bring it along! 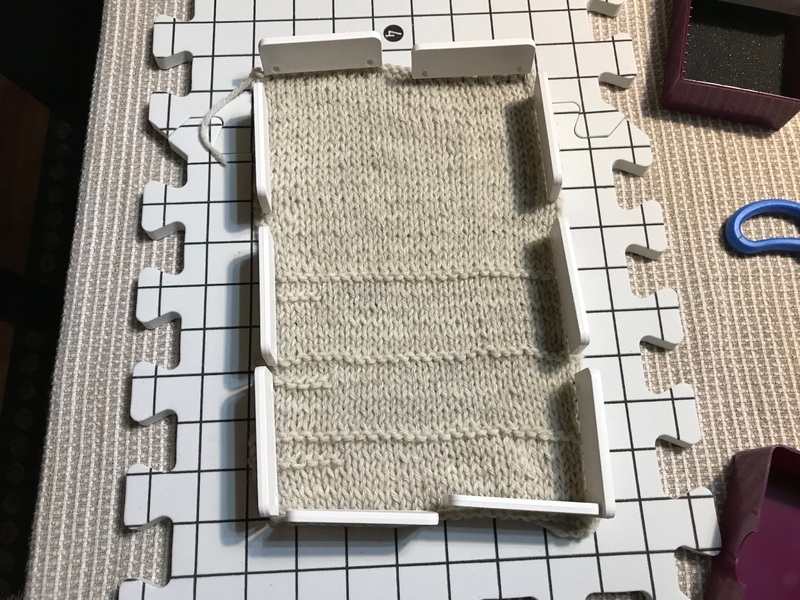 I’m a believer in knitting gauge swatches, as you know. I hope your cardigan turns out perfectly! The afghan is looking good, it’s nice to work on a big project. I guess I was never smart enough to buy extra yarn for a project so that I could gauge swatch! Luckily, I had plenty of the yarn I wanted to use on hand. Since we're taking this step-by-step, I have high hopes for success. Love the colors in the Afghan. I am sure your cardigan is going tibfit oerfectly. I hope so, Gracie! My mom doesn't knit much any more, but she used to knit beautiful sweaters for us, and I've always wanted to be just like Mom! Love the Afghan great array of colours. 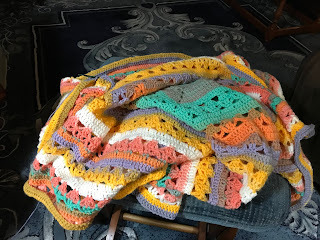 I almost thought the afghan was finished! I'm fascinated by the way that yarn changes colors! Sometimes I'm a bit of a maverick! After I discovered Continental knitting, which goes much faster for me than 'British/American', I stopped doing swatches. (Sshh, don't tell anyone!) 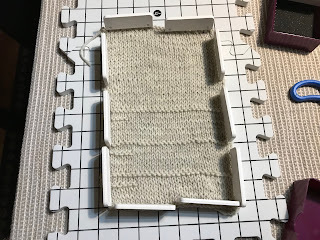 Somehow even though my swatch was correct, when I put on the number of stitches required for the sweater, sometimes the gauge got out of whack after knitting a few inches. If so, I would just start the sweater over. I always used a sweater from my closet to get my measurements. I'm wondering how much shaping you'll have to do. These days sweater construction isn't as complicated as it used to be. I'll be interested in seeing your pattern! Pullovers are easier than cardigans!